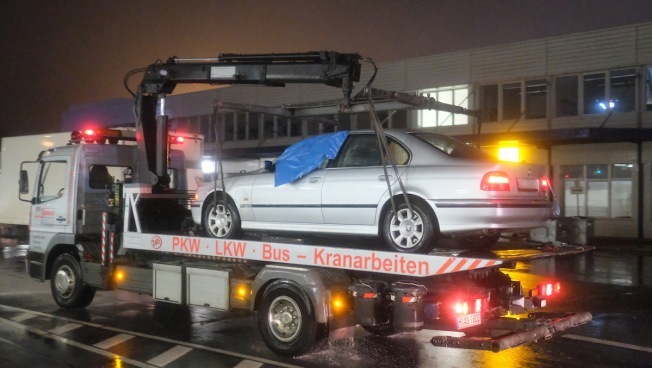 Pictured is the car used by a man who forced himself onto Hannover Airport's apron on Dec. 29, 2018. A man forced open a locked gate on the security perimeter of Hannover Airport in northern Germany and drove a car onto the airfield Saturday before coming to a halt underneath an airliner and being detained, police said. Police said a test suggested that the driver, who told them he was a 21-year-old from Poland, was under the influence of drugs and there were no indications that his actions were terror-related. The man was believed to have acted alone. He apparently has no official residence in Germany. Federal police told the German news agency DPA that the driver tested positive for amphetamines and cocaine. They said the man wasn't carrying an identity card. The police statement issued later Saturday said authorities had taken a blood sample and were still working to be certain of his identity. Police opened an investigation on suspicion of dangerous interference in air traffic and resisting officers, and were considering whether to have the man taken before a judge Sunday to try to have him kept in custody. His motive remained unclear.